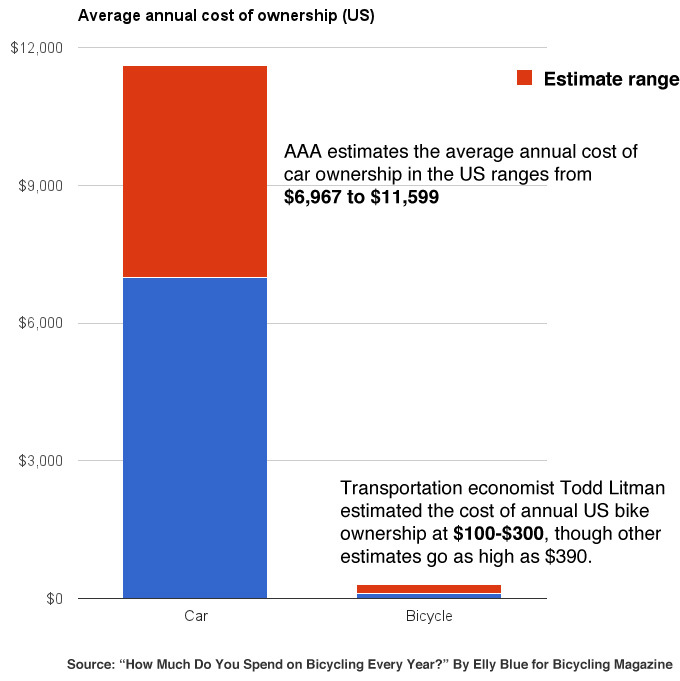 A while back I wrote a fact-check of the $308 figure that gets bandied about as the annual cost of bicycling in the US. As I discovered, the number is entirely false; it’s based on an old data entry error that quietly persisted until it became taken for granted as a fact. 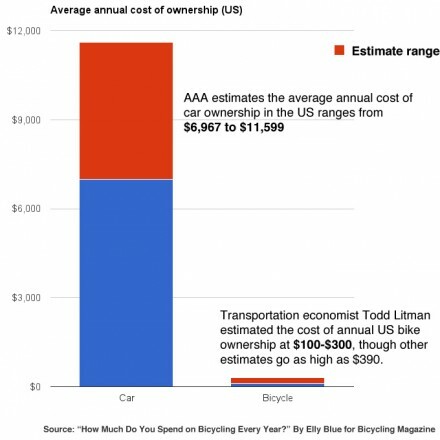 I found (as often seems to be the case) that transportation economist Todd Litman had already come up with a much better calculation for the annual cost of riding, using the same metric that is used to calculate the yearly cost of driving. The price of a new vehicle is spread across the life of that vehicle, and the cost of repairs are calculated per-mile. It’s interesting to compare these numbers with how much people actually spend. I figured I’d share my own bike spending over the last decade here and encourage readers to do the same. 2009: A solid used bike from a friend, colorfully painted and covered and stickers, for traveling. $100. 2013: A used Brompton folding bike! My most extravagant bike purchase at $1250, plus around $150 for a touring pannier, so a total of $1400. Next, maintenance. This should be calculated per mile, but I have absolutely no clue what sort of mileage I’ve been riding in the last decade except that it’s been wildly inconsistent — I probably put in 150 per week back in 2007, but nowadays I’m lucky to get in 20. And there really should be some kind of multiplier for weight carried, since that puts more wear and tear on the bike than mere pedal strokes. At the same time, during my years of heaviest mileage, I did most of my own maintenance; now I pay more for that. Looking back at my spending for the last three years, which is what I have accessible records for, I’ve spent an average of just over $100 each year. Mostly on maintenance, but I also bought a new helmet during that time, new tires once, and–let’s get serious here–a coffee cup holder for my Xtracycle’s handlebars. Given that I spent far less or nothing it all earlier in the decade, $100/year seems like a more than safe estimate. Considering that the cost of driving ranges from a few thousand to over $12,000 per year (the AAA estimates it at nearly $10k as an average for a new car), even if I were to spend the next couple of years splurging on double kickstands, pannier upgrades, and even a fancy cargo bike with an electric assist, I’d still be ahead of the game. What’s your annual cost of bicycling? Keep in mind that these calculations are intended for transportation bicycling rather than sports, which I suspect plays by very different economic rules.